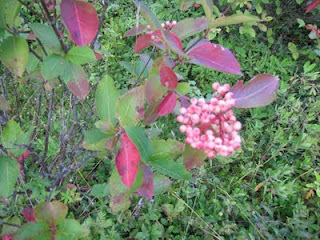 Last fall, Andrew noticed this plant over in our uncle's woodlot, next to ours. 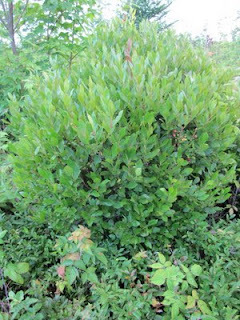 I figured at that time, it might be a native highbush blueberry. We kept our eye on it. Late this spring it produced flowers very similar to blueberries. Yes! It was a highbush Blueberry. Andrew was over the other night and brought back a few berries, they liked a bit like blueberry, similar in size but they were almost black. OK, out comes the Flora of NS (old version but still good). There are two species of Huckleberries in Nova Scotia. According to the NS Wild Flora Society, Gaylussacia baccata (Black Huckleberry) is found in sandy, rocky barrens or on the edges of dry woods and lakeshores. Our two plants that we found were on the edge of a 'sand pit'. This is just a vein of sand that runs through the property. I use the sand in my soil mix for my perennials and we have also use some in our vegetable garden to loosen up our clay soil. The fruit of the Huckleberry is smooth, black or bluish and sweet and the leaves turn to a brilliant red in the fall. There is also an abundance of blueberries and creeping blackberries in that area. Back we go with the camera to take a few pictures and to just see what else was out there We kept going on our tour back over to the cranberry bog to see how the cranberries were coming along. There is going to be an amazing crop this year. I could have swore I took a picture of the cranberries but I can't find it anywhere even in the 'trash'. I must be losing my mind. 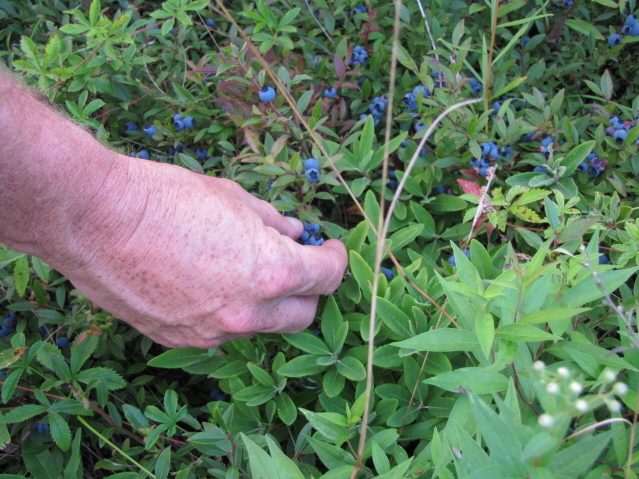 The low bush Blueberries are quite abundant also and do they ever taste good. Every time I go over there we find something new, this is the area that we found the orchids. There was an abundance of cotton grass (pictures blurry, not posted﻿) and may small Viburnum cassinoides (Witherod). 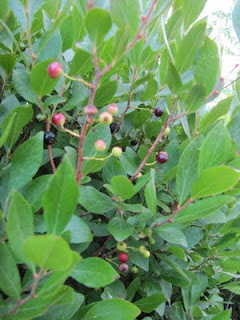 These, like the huckleberry, will turn colour in the fall. I must try to collect some seed when the fruit turns dark blue. There seems to be a streak of blue running through this blog, but that will change to red when the cranberries are ready.